Once again each of the New Lenox Fire Protection District’s (NLFPD) four fire stations will have a large wreath on the front of them with all red lights. These wreaths are not just decorations for the holidays; they are there with a purpose. “The red wreaths serve as a reminder for all New Lenox residents to be safe when decorating this holiday season,” stated Dan Turner, NLFPD Deputy Fire Chief. The wreaths are part of the “Keep the Wreath Red” fire safety campaign, a statewide program that reminds everyone to practice fire safety during the holiday season. 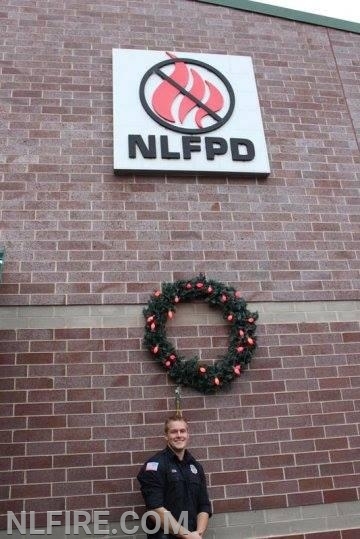 “The wreaths feature decorative red lights, and for each fire caused by holiday decorations, the NLFPD will replace one red bulb with a white bulb,” said Turner. The wreaths will be on each of New Lenox's fire stations from Friday, November 23rd through January 1st. Remember to check all smoke alarms and carbon monoxide detectors in your home. For more information contact the NLFPD at 815-463-4500, www.nlfire.com, or visit us on Facebook. For additional winter safety information go to www.NFPA.org.